Are you familiar with the term "hygge"? It's a Danish term that has caught on in the U.S. because it speaks to the feelings of coziness and relaxation we seek during the winter months. It emphasizes the simple things in life and feelings of a life well-lived. One of the ways I create hygge this time of year is by making sure my collection of African violets and orchids is happy and healthy. Your houseplants are most likely crying out for some attention right now. If you are like me, you ignored them a bit during the busy holidays. After all the festive decorations are put away, it's time to give your plants a lovely spa treatment. Read on for tips on how to care for orchid plants and African violets in winter. 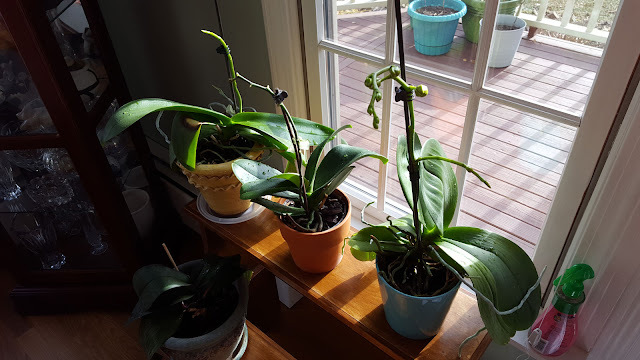 This time of year, my orchids are in growth mode. All, but one, are setting buds that will soon produce the beautiful orchid blooms I love. I want to be sure I'm setting them up for successful growth and the blossoms I love. All of these orchids are rebloomers. Your orchids can rebloom, too. If you are new to growing orchids at home you'll want to read my blog post about growing orchids and watch my video, below. The basics of growing orchids are covered there. The dry air in your home during the winter months is not a friend to your orchids. This is a good time to take your orchids to your kitchen sink and give them a good shower. Take them out of their decorative container first. You don't want any water to collect in the container. Let all the water drain before returning your plant to its decorative container. Do this once a week during the dry winter months. You also want to be sure to fertilize as your orchid is growing and setting buds. Make sure you are using a fertilizer formulated for orchids or a very weak mixture of a balanced liquid fertilizer. Only add fertilizer after you have watered. Fertilizer on a dry plant may burn the roots or leaves. Finally, stake and secure the stalks of the plant with clips or ribbons. You'll be moving the clips up the stalk as the plant grows. This is important because the blossoms buds will get heavy as they develop weighing down the stalk. 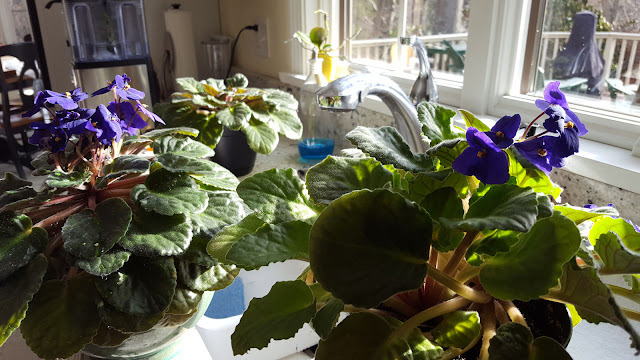 Winter is a good time of year for my African violets. They seem to like the cool nights and the dry air. For their spa treatment, I take them to my kitchen sink and give them a drink of water from the top. African violets prefer watering from the bottom of the plant, but every once in a while, I give them a top-down watering. African violets like to dry out between waterings. 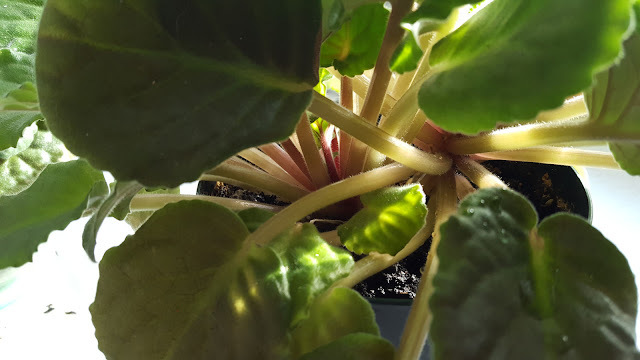 Check out my African violet care blog post and the African violet video below for detailed information about caring for African violets. This is a good time to remove all the dead or wilted leaves and check to see if your plant needs re-potting. The plant pictured below definitely needs re-potting. I have two good-sized baby plants in this one pot. Follow my tips in the blog post and video when re-potting and your plants will thrive. 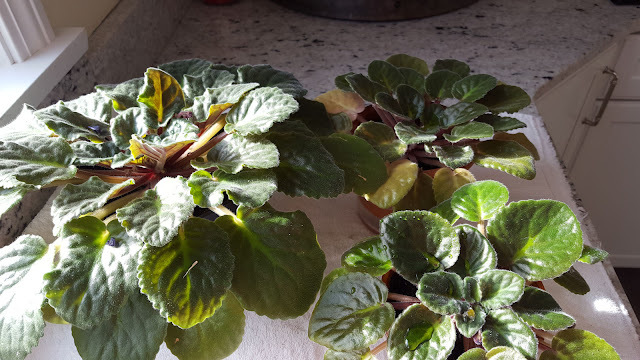 These are three re-potted African violet plants that were re-potted in the video. You can see they are doing very well. That's all you need to do to ensure happy African violets during the winter months. Easy peasy. 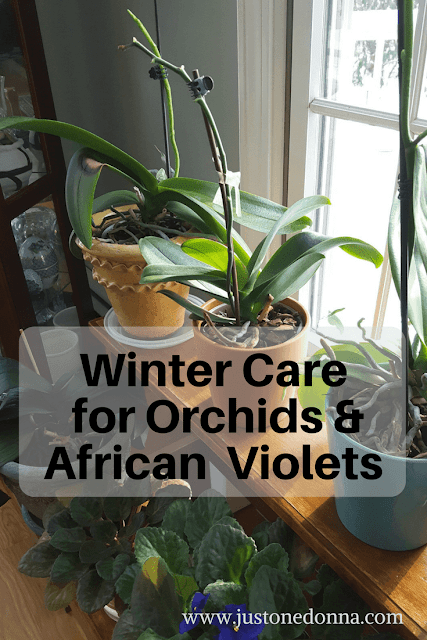 Take care of your orchids and African violets now and they will add color and joy to your home during the dreary days of winter. That's what I call hygge. Thank you for sharing these tips with your orchid and African violet loving friends. Your shares on Facebook, Twitter, and Pinterest are appreciated. Thank you! Mine are having trouble recently. Thanks for the information about African Violets. My first time to grow them. Got these three cheap from Lowe’s . Cleaned them up and water them. They have a celephane around pot and a rubber band. I removed ugly leaves and spent blossoms. Do I removes the whole leaf stem too? Yes, remove the leaf and the stem. You’ll be surprised how quickly new leaves are produced. Remove the cellophane and rubber band from the pot, too. Be sure not to over water. Just follow my tips and you’ll have happy, healthy plants. Good luck. The stems on my African violet are long and the leaves are splayed out, even after receiving lots of indirect light. What causes this? If you are referring to the central stem of your plant it is most likely that the plant is an old one. I’ve had success repotting those plants, placing the stem deep into the soil. You can give that a try. There is a point where you may just want to dispose of an old plant as well.